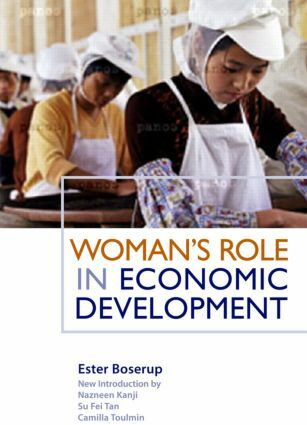 This classic text by Ester Boserup was the first investigation ever undertaken into what happens to women in the process of economic and social growth throughout the developing world, thereby serving as an international benchmark. In the context of the ongoing struggle for women's rights, massive urbanization and international efforts to reduce poverty, this book continues to be a vital text for economists, sociologists, development workers, activists and all those who take an active interest in women's social and economic circumstances and problems throughout the world. A substantial new Introduction by Nazneen Kanji, Su Fei Tan and Camilla Toulmin reflects on Boserup's legacy as a scholar and activist, and the continuing relevance of her work. This highlights the key issue of how the role of women in economic development has or has not changed over the past four decades in developing countries, and covers crucial current topics including: women and inequality, international and national migration, conflict, HIV and AIDS, markets and employment, urbanization, leadership, property rights, global processes, including the Millennium Development Goals, and barriers to change.